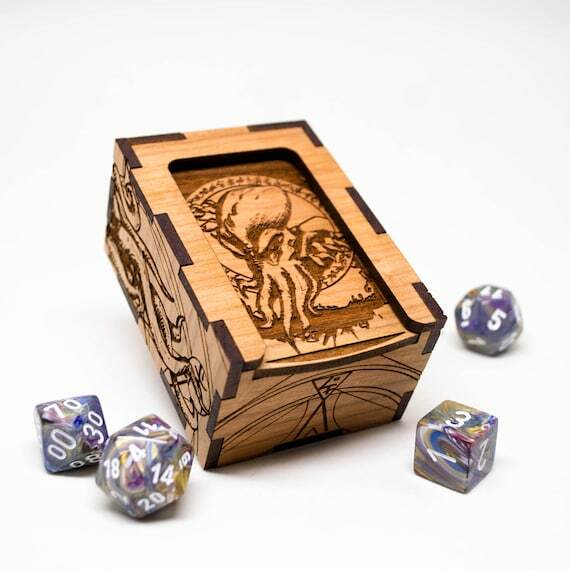 For Cthulhu fans, this Cthulhu dice box is a great thematically appropriate way of carrying around your Cthulhu dice. Available from Etsy for just $20, the dice box is wee and just big enough to hold one set of dice. If you need more storage capacity, the crafter also offers them in larger sizes. 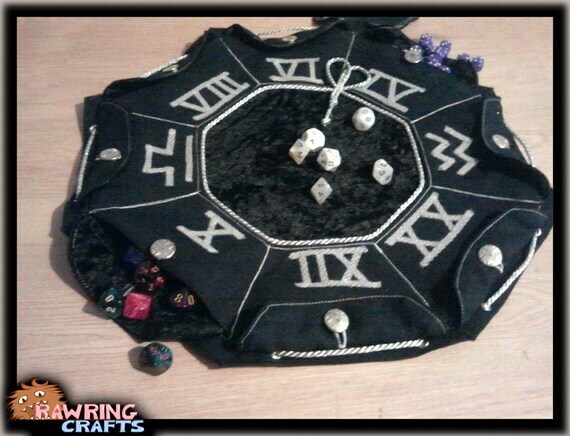 Another cool Etsy find, this hand made wizard pouch dice bag is likely to be appreciated by many D&D players. The dice bag folds out to lie completely flat, providing a rolling surface. 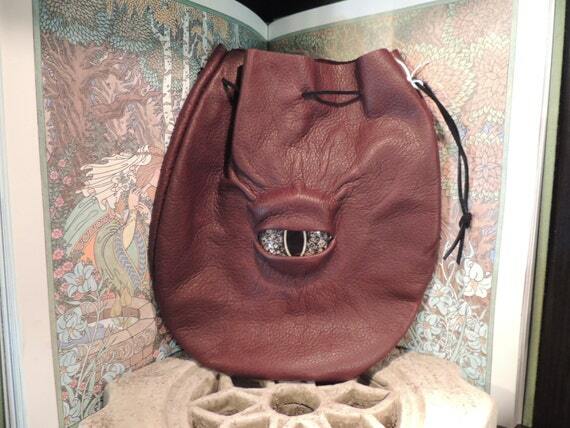 And surrounding the bag are eight individual pouches to hold dice. I can’t quite tell from the pictures, but it looks like the pouches are on the inside of the dice bag when it’s closed up in carrying mode — and the exterior just looks like velvet. Personally, I think I’d rather have the pouches on the outside — I bet it’d look cooler when closed that way. But it’s still pretty impressive. What 3D printing has done for unique dice, Etsy has done for dice accessories — particularly dice bags. I recently came across this truly awesome Monster Eye Dice Bag at an Etsy shop. I’m considering doing a whole series of dice-related Etsy finds. Just need to decide whether to make a couple monster posts (all dice bags, all dice boxes, all dice-themed things) or break it up and have each find be a separate post. Given how little time I’ve been giving to this site, making each one a separate post will probably make it more likely that I’ll get something up! Either way, look forward to more of these finds in the Cool Dice section. When i was a wee gamer I distinctly remember the first time I saw gemstone dice: they were in a glass case at my local game store and I thought they were just about the coolest thing ever. Of course, there was no fathomable way I was ever going to have the money to afford such an incredible luxury! Flash forward a decade or two, and gemstone dice are much easier to find, and the price has come down substantially. As far as I’m aware, the original stone dice manufacturer was Crystal Caste with their “Dwarven Dice.” Their sets were (and still are) incredibly expensive, and to get the price down they offer a lot of sets in miniature sizes rather than as standard-sized dice. Nowadays you can get the same cool stone D&D dice at full size and only somewhat expensive prices — averaging around $50 for a set, it’s still more expensive than my teenager self could have considered buying, but is now a comfortable indulgence. If you’re in need of a gift for a gamer, gemstone dice might be a good solution. No matter how many dice your gamer friend or loved one has, he or she will be thrilled to get dice carved from actual stone! The commercialization of 3D printing has been a great thing for collectors of unique dice. One of my favorite creators is Ceramic Wombat, and I recently noticed his Labyrinthine D6 — which to my eyes looked immediately like a Borg cube. The die is about 3 centimeters, or about twice the size of a standard gaming die. The die itself is a labyrinth — unlike a maze, a labyrinth has just one path with no choices to be made. This labyrinth d6 actually has a single path through it that starts at the number 1, and goes around each surface of the die, touching each number in order before ending at the 6. While most gamers, myself included, want the coolest, unique dice that stand out, there is certainly something to be said for just focusing on price. After all, the cheapest dice out there will roll just as good as the multi-hundred dollar Artisan Dice sets. 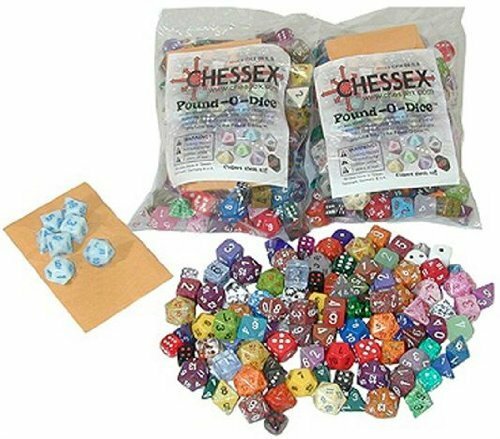 The Pound of Dice, made famous by Chessex. It’s a bag of around 100 assorted dice in different sizes and colors — including a lot of clearly messed up color combinations and particularly ugly dice. You can buy it on Amazon for around $22 — which is just 22 cents per die. If you want just a single D&D set, you can get cheap opaque dice sets for under $4 per set — or about 55 cents per die. Of course, the best way to get cheap dice is to inherit them from a veteran gamer. Most RPG gamers gather dice over the years, and usually have a pile of ugly ones they never use anymore that they’re happy to pass on to an owner who will make use of them! As we’re coming up to Black Friday & Cyber Monday, it’s worth taking a look at one of the cool gift items: dice necklaces. I’ve seen several different types of dice necklaces out there, by I think the coolest one so far is this lovely one for sale on Chained Creativity. When you look closely, you can see that the cage that encases the d20 is just a series of rings fastened together, but it forms a really attractive bit of jewelry. The maker of this necklace makes them with all kinds of different d20s inside — just poke around her store a bit. For other awesome geek gifts, ThinkGeek is filled with awesome stuff as always, and for non-geek shopping, you can check out Wayfair Coupons — it’s kinda like Amazon for home stuff, but with better filters making it easy to find stuff. There are a decent number of awesome craft gamer products out there, and thanks to Etsy, a lot of those cool craft projects are available to buy. One of the cooler looking ones I’ve seen recently is stained glass dice. You can buy these stained glass, hand-crafted dice over at DiceyDecor’s Etsy Store — as cool as these things are (and they’re really cool) they are too ginormous to roll, and I suspect they’d probably break if you did try to roll them anyway — the description on the Etsy store stresses that they are not intended for game play. So these are strictly a decoration, rather than something you can actually game with. 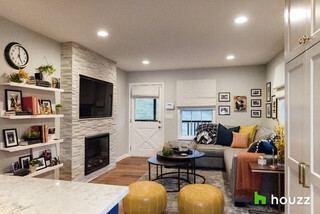 But a classy decoration, I think we can agree. One of the most delightful holiday gift products you can get the gamer in your life is the Critical Hit LED d20 from ThinkGeek. This is a large plastic d20 that blinks red red you roll a natural 20. The LED d20 is totally awesome; however, in practice it’s not terribly practical. The die is awkwardly large and all the electronics inside make it pretty clearly unbalanced. You need a good amount of space to roll it (I’ve found the best way is to spin it in the air, since it won’t roll much on the table). For day to day gaming the Critical Hit d20 it’s terribly practical; however, for special occasions, for GMs running one-off con games, and for showing off it’s awesomeness to your friends the LED d20 is a pretty sure-fire hit for any gamer.